Criollo horses are native of Uruguay, Argentina, Brazil, and Paraguay. They may have the best endurance of any horse breed in the world next to Arabian horses. In fact, due to a low basal metabolism, they may be a better long-distance horse than Arabians in prolonged races over a week in duration with no supplemental feed. Because of their hardiness and stamina they are very popular in its home countries. The word criollo originally referred to human and animals of pure-bred Spanish ancestry that were born in the Americas, or, in Portuguese crioulo, to animals or slaves born in the Americas. In time, the meaning of the word would simply come to refer to native breeds of the Americas. 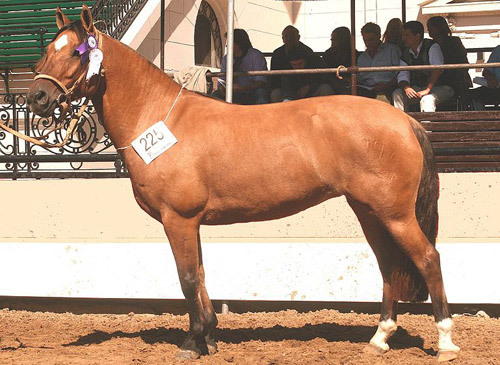 Criollo bloodlines come from selective breeding of Baguales horses. Baguales horses are feral horses of the Pampas (fertile South American lowlands,). They were bred for use as cattle and riding horses. Their ancestors came from Spanish stock brought during exploration of the South American continent. Many animals escaped or were left behind to formed feral herds that roamed the Pampas. The feral animals of the Pampas were influenced by imported animals over the years. This included Portuguese and Dutch breeds, the blood of which distinguishes the Argentine Criollo from the animals found in Peru and Columbia. These herds proved useful to the local tribesmen who began to depend on them and became great horsemen. During the early 19th century both English Thoroughbred and Percheron horses were introduced to Argentina. Subsequently, their bloodlines were added to the Criollo mix. They were crossed with Thoroughbred for refinement and elegance, with the Percheron for size and strength. Sadly, with all of this cross-breeding the original bloodlines of the Pampas had become diluted and extremely rare by the end of the 19th century. In 1917, the Sociedad Rural de Argentina was created to preserve the “creole” horse of Argentina. They located a herd of mares with pure breeding which became the foundation for regenerating the breed. At first the breed was called the Argentinean, then Argentine Criollo, but now they are simply referred to as Criollo horses. Every year The Criollo Breeders Association organizes an endurance ride which tests the stamina of purebred Criollo horses. The ride lasts covers 465 miles, 14 days and must be completed in less than seventy-five hours. Horses carry a minimum of 250 pounds and are allowed no food other than what is found along the trail.